Me and Ritz crackers go way back. When I was a kid (like...2nd-4th grades I believe) I used to have to go to the speech trailer at my school (which was a Catholic school, and I had to walk through the cemetery to get to the speech trailer)-I had difficulty pronouncing my "r's" correctly (they came out like "w's"..."wabbit"...etc.). Anyway, I had a great speech therapist and it was always fun and the problem was resolved, I can now say...well...resolved (not wesolved). One of my most vivid memories of going there was that I would always immediately attack a sleeve of Ritz crackers with glee. I don't know why. But they were there and I always ate them. And I loved it. Now-a-days I use Ritz crackers in my cooking, as well as to occasionally spread some peanut butter on as a snack. But...you guys know me and processed stuff...it just...makes me feel ugh. Have you read the ingredients on Ritz crackers? Ugh! 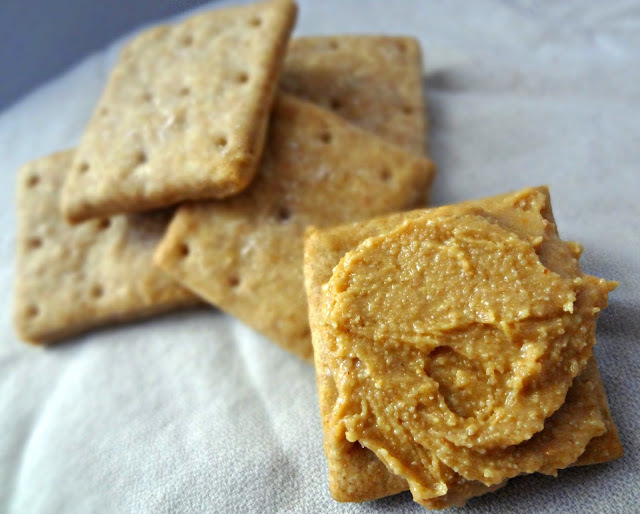 Anywhozzle, one day I had a bunch of super salty homemade peanut butter at my disposal (accidentally used dry roasted peanuts) and I like really wanted to use it on Ritz crackers. But I didn't want to buy them. So I figured....how hard could they be to make? I did a little google-ing, found a recipe, and turns out-not very hard at all! These crackers definitely don't taste exactly like Ritz (although perhaps the fact that I healthified these by subbing in half whole wheat contributed) but they are still super good. Definitely best on the day they're made, but I always manage to eat them leftover too. And the best part is-I don't feel bad at all about eating them. Nothing but pure contentment here. 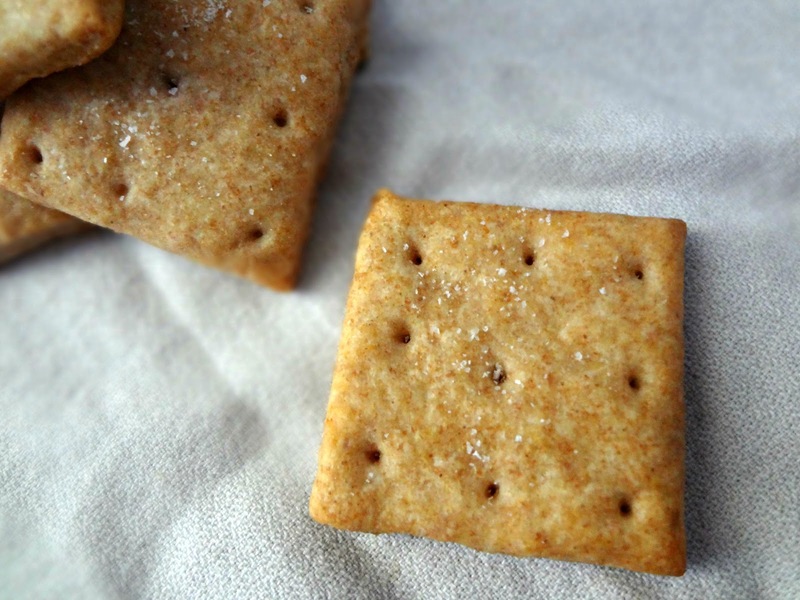 Adapted from Cupcake Project's "Homemade Ritz Crackers"
Preheat oven to 400 degrees. Line 2 pans with parchment paper. Combine flours, baking powder, sugar, and 1/2 tsp. salt in a food processor. Add in the cold butter, pulse until the butter is broken into smaller pieces and the mixture resembles coarse crumbs. 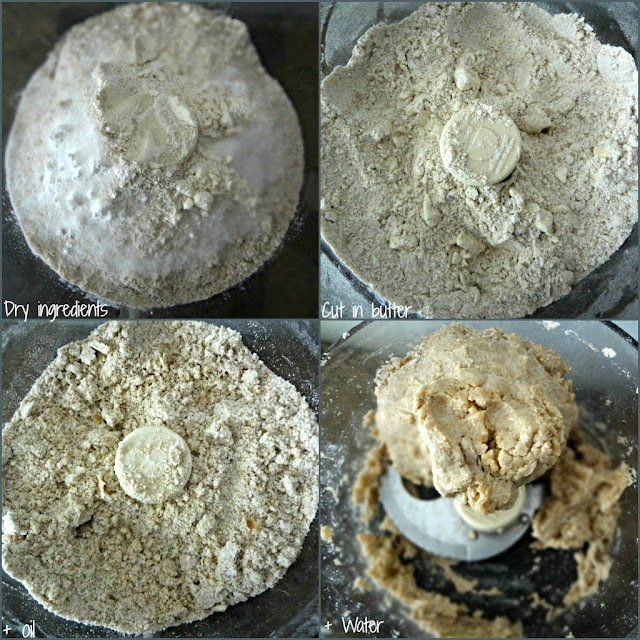 Add water, a little at a time, and pulse until a ball of dough forms. 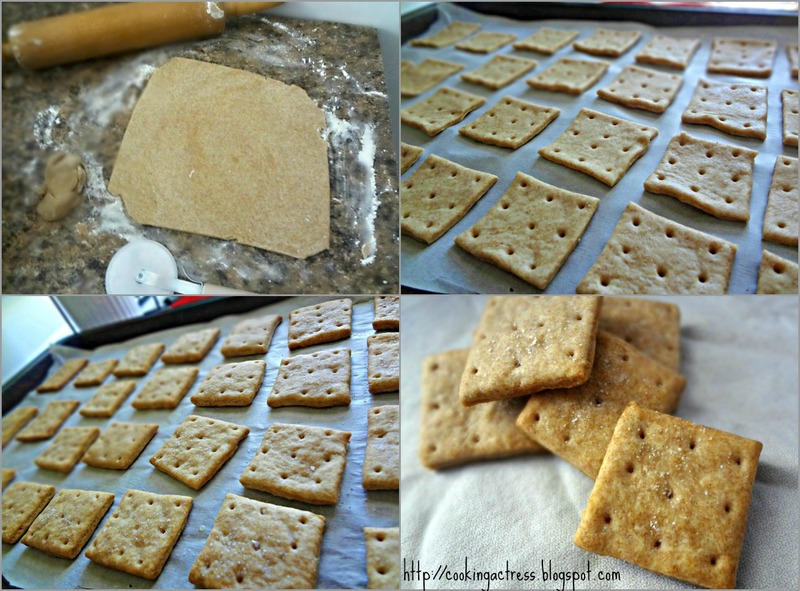 Using cookie cutters, a pizza cutter, or whatever you desire cut dough into desired cracker shape. Transfer cut out dough onto sheets, leaving some space between. Poke holes into the dough (using a skewer, toothpick, end of a thermometer, fork, etc.) into desired pattern. Bake 10+ minutes, until lightly browned. Mix melted butter and 1/2 tsp. salt. Brush onto cooked crackers. If desired, sprinkle kosher/sea salt on top.